Hiya guys! I'm over here not so patiently waiting for Halloween. I keep changing my mind on what I want to end up doing. Can we just extend Halloween from being a day to being a whole month? Haha. I'm sure I'm not the only one who feels that way! But since that can't happen, I'll just pretend by swatching all these amazing Halloween inspired polishes. Today I'm sharing swatches for Annabel Lee by Supernatural Lacquer, which is part of a Edgar Allan Poe themed box from Aroma Rebel. The box is filled with a bunch of goodies including two bath soaps, a sea salt scrub, a bath bomb, and nail decals. Let's get right to it! 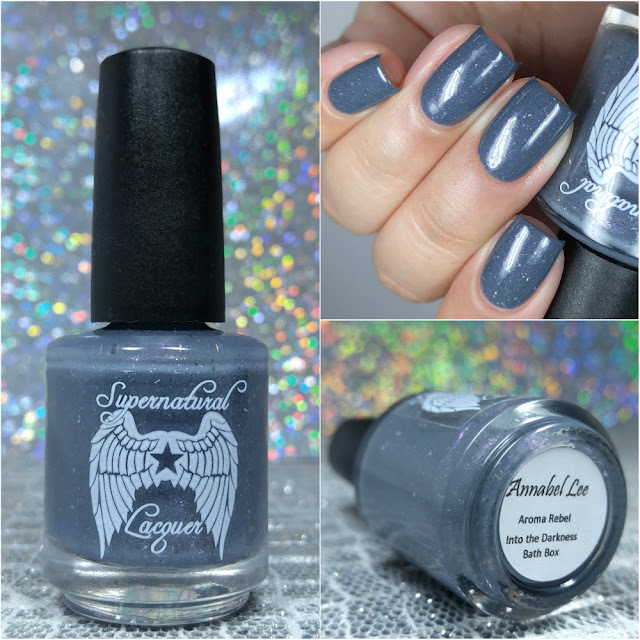 Annabel Lee by Supernatural Lacquer will be releasing on Saturday, October 15th at 5PM PST as part of the Aroma Rebel Box. Each box will retail for $40 (price includes US shipping) and is extremely limited. Annabel Lee can be described as a dark greyish blue filled with micro-glitters and iridescent flakies. I cannot stop swooning over this gorgeous shade! I have always made it a point to say how much grey is an understated color, we need to see more of it. And here's a perfect one! It does lean a little on the blue side, but not enough to overtake the grey undertones. Not to mention, it has so much sparkle and shine due to all the glitters and flakies. Photos don't end up doing it any justice. The formula has a really smooth and opaque application, although not enough to be a one coater. It does build up nicely on the nail without the glitters and flakies clumping. It has such a great consistency as well, not too thick or too thin. It dries to a gritty finish and needs topcoat in order to smooth out. Shown here is two coats and sealed with a glossy topcoat. To recap, Annabel Lee by Supernatural Lacquer will be releasing on Saturday, October 15th at 5PM PST as part of the Aroma Rebel Box. Each box will retail for $40 (price includes US shipping) and is extremely limited. Set those alarms!